If you have been an reader of our blog, you realize that our slow demise mentally & physically is an ongoing up to this point. Now it's beginning to hit a climatic breaking point. Jennifer's health continued to deteriorate. She experienced stomach issues and had to have her gallbladder removed She's tired and beginning to show signs of depression. The younger girls, Heidi & Emi, have illnesses on a daily basis. Despite constantly going to the doctor they have no answers on why they are sick or what could be causing it. They prescribe antibiotics & other medicines but those only seem to slow it down but not cure it. Chloe has become distant and less involved with the family. We are slowly being torn apart, one thread at a time. Bad days far out number good days now. Our only recourse now seems to be to try to distant ourselves from the activity. We feel we have a good idea of the hot spots so we make them off limits. The back bedroom is now vacant. No one is allowed in the basement. Jennifer sleeps with the girls in the living room. I sleep with Maya in what is now an open bedroom. Everyone knows where everyone else is at all times. Finally, under no circumstances is anyone allowed to stay home alone. The holidays arrive but it means nothing to us. Everything seemed to pile on top of us pushing us down. It was a feeling that someone was slowly eating away at us; keeping us under their control. Nothing brought us happiness regardless of what we tried. Compounding our problem was a strain of Canine parvovirus that ran through our kennel. It killed 16 puppies in less than 10 days. 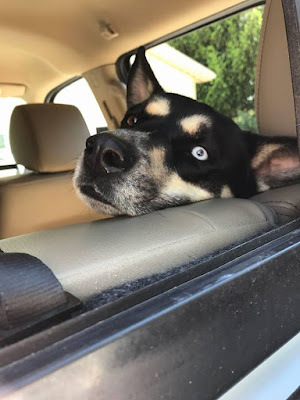 The virus was planted in our home but a careless individual who dropped off her sick dog in our kennel area in the middle of the night without telling us. This does nothing but adds to Jennifer depression and makes her more vulnerable to attacks. I feel as if she is slowly drifting away. We started asking for things to be returned if they've been taken. Sometimes things come back and sometimes they don't. Case in point, it was our anniversary and Jennifer had laid an envelope full of cash on the bar for us to use on our night out. It was in plain site and I remember seeing it setting there. As we about to walk out the door, she goes to get it and it's gone. We searched everywhere but it's nowhere to be found. Finally Jennifer says, "It's our anniversary, please give my money back so we can celebrate." Within in minutes it appears back on the bar like it had never been touched. Things continue to happen despite our efforts to contain it. Doors open and close, we hear voices, things disappear, and the screaming man and woman seem to be screaming at each other now with us being caught in the middle. The smell of pipe and cigarette smoke continues to fill our house. It's difficult for us to decipher what's good versus what has harmful intentions so we treat everything as hostile. We have stopped talking to others about our issues because we feel it's counterproductive and doesn't serve a purpose but to make us some sort of novelty; like a freak show at a carnival. We've become withdrawn and only venture out out of necessity. We too tired to fight at this point. We're helpless, lost, and have no one & nowhere to turn. We're at the end of our rope but there's nowhere safe to fall. Hi, I'm Maya & I'm here to protect you. It's now winter at Mis Mas Tejas Ranch and the activity is pounding on us like a hammer. The cold dreary days just add to our fear and anxiety. The girls no longer sleep in their bedrooms because they're too afraid. Jennifer sleeps with them on the couch. The girls are sick most days and are starting to miss a lot of school. Jennifer's health is also trending downward. The activity is running at full throttle now. So much so that's it's hard to single one thing out versus something else. Spoon traveling to who knows where and then returning. Light bulbs having to be replaced weekly. It appears that some of the activity is now targeting and trying to cause harm. We have knives that disappear then we will find them stuck in the ceiling. We will find our silverware scattered all over the kitchen floor. However, the scariest things happen in the basement. I went into the basement late one afternoon, while there the door slammed shut. It slammed so hard that it knocked off some of the pictures off the wall upstairs. I was terrified and I ran as quickly as I could to the door however, I couldn't open it. Jennifer and Chloe were on the other side trying to push it open but when we would get it opened just a little, it would slam back shut. Finally without warning, it just flew open. I got out of there as fast as I could. We decide that the basement is off limits-no one is to go down there. One day Chloe tells us that her boyfriend found a stray dog and he wants to keep it but he has to ask his parents. Until he can do that, he want's to keep the dog out our place. The last thing I wanted was another dog at the house. My answer is "negative Ghostrider, the kennel is full." However, at my house, I'm like the Queen of England; I'm the Head of State yet I have no authority. My no vote on the dog is overruled by Jennifer. Just as I thought, his parents say no. She's a unique looking dog. She appears to be part Husky and German Shepard. She has one brown eye and one blue eye. She's well behaved and we quickly learn she's been trained to be some sort of service dog. I find it very strange that a dog like this would just be wondering the streets. She obviously belongs to someone. I post everywhere but no one knows who's dog it is and no one claims her. She becomes a member of our family. We name her Maya. Hi, I'm Maya. I here to protect you. One thing I noticed right away about Maya was that she likes me a lot. She stays by my side and always wants to be around me. I get the sense that she wants to protect me. She sleeps in the room with me, she lays next to me when I'm sitting down, she'll follow me around when I'm outside. She stays within eye sight of me nearly all the time. Also, she can sense where I am when she's not with me. If I would go down in the basement, she would figure it out and would run down there to be with me. She was protecting me. If something was around me, she would perk up. Look around and sometimes have a low growl. She would do this until whatever was around me was gone. One time, in the middle of the night, I was awoken by a door shutting. I didn't think much of it as I thought it was just one of the girls. I soon heard heavy, slow foot steps. It was someone who was wearing boots and the steps & strides made me think it was a man. Maya jumped on the bed and laid across my chest I was petrified with fear but I watched as Maya's head followed every step. When the footsteps stopped she jumped down and ran to the place where they stopped. The back of Maya's tag. Blessed are those who protect. 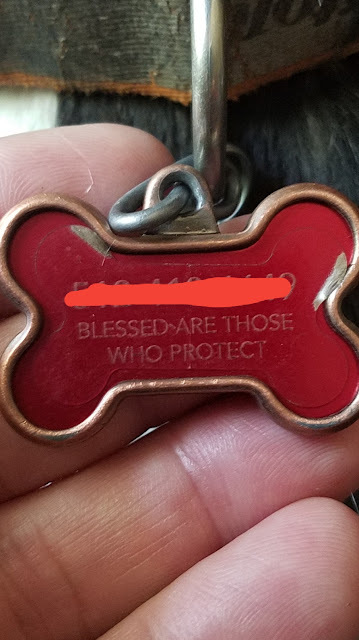 I always thought this dog was sent to protect us, now I know it's true. 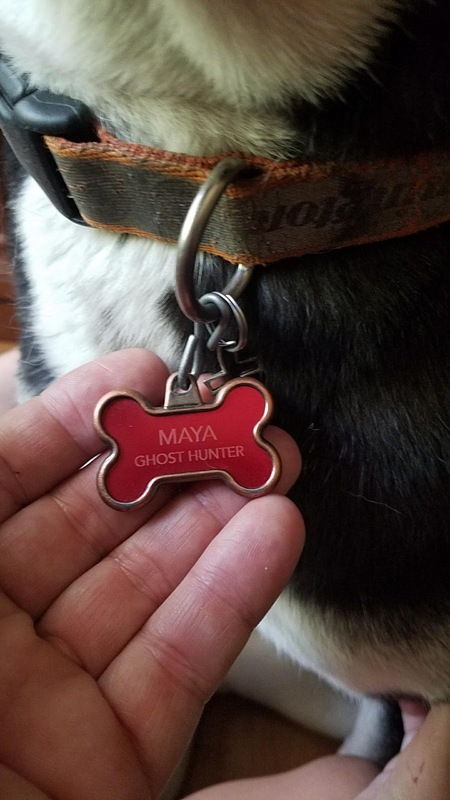 Her tag reflects what she does for us. Hey Everyone! If you want to hear us talk about our experiences and take questions, you can do so tonight at 7:00 pm CST. We'll be on Voices Carry Radio Show doing just that! We'll talk about our story and how The Dead Files helped us! Just Click on the link below! Hope to see you there! At this point in our story, we are feeling more hopeless than ever. The help we got from the paranormal team turned our lives into a dangerous nightmare, help from The Dead Files was on hold, and we have nowhere to go or anyone to talk with about what's happening. We turned to the internet but the amount of conflicting information was overwhelming so that wasn't a viable option. We have pretty much stopped watching paranormal shows. Ghost Adventures turned in a prime time drama that only seemed to serve Zak Bagans ego. Other shows just seemed all about finding something but not getting rid of it in any type of manner that seemed legitimate. We would still occasionally watch the Dead Files as it stayed true to it's roots-finding out what was happening and then making a plan to get rid of it. Sadly, most of the episodes were repeats but we would still pick up new tips here and there. Learning what to do and being able to do it are two different things. We lacked drive and motivation. We were having the life sucked out of us and the things in our home were pushing down. My pain was overwhelming now. Jennifer was getting sick for no reason whatsoever. The girls were scared, sick, and exhausted. We were arguing, depressed, and lost. Happiness was a distant memory. We were losing our will to fight; we're losing our souls. The screaming was happening at feverish pitch all over the house. Things were flying through the air almost daily. Electronics & appliances began to take on lives of their own. They would stop working, reprogram themselves, or just breakdown altogether. 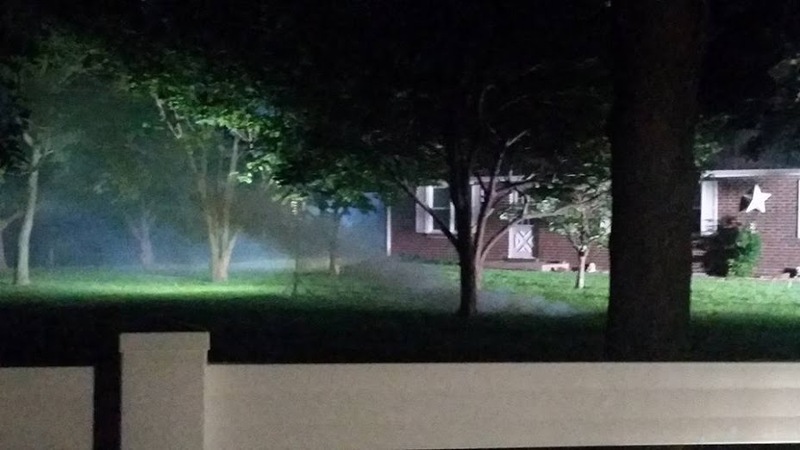 We were now seeing shadows walking in front of the house windows. We could hear children laughing, footsteps, and adults laughing or talking. Doors would close on their own. Light bulbs would constantly have to be replaced-even the expensive ones that are suppose to last 20 years. To us, everything seemed to be centered around the spoon It would come and go as it pleased. We would hear it come crashing back and say "Spoon's back". We would then pick it up and put it back on the counter. We decided to try to catch it leaving on video one last time. We placed it on the dining room table and prop camera phone up pointing on the spoon & let the video record. I'm in the dining room working and all the sudden I hear a voice yell in my ear "HEY!" I jump up and turnaround. I hear the spoon hitting the floor along with the camera phone. A small pumpkin sitting on the table flies off into the living room nearly hitting Heidi. It flew close to 15 feet before it smashed onto the floor. The camera phone kept rolling despite hitting the floor. It was facing upwards and caught the pumpkin leaving the table. Jennifer watched the video first and then asked me to come outside so she could show it to me. We hear the "HEY! ", me yell, the spoon hitting the floor, and then the camera phone hitting the ground. Then we saw it-hands. They didn't look human though. They were long, bony , and distorted. They then appeared to pick up the pumpkin without touching it. Heidi screams, the pumpkin hits the floor and you hear the chaos & fear that follows. After seeing the video my heart sinks. My fear is overwhelming because now I have a visual of what's on the other side. I know that it can pick up stuff and throw it without even touching it! We decide we don't want to try to document anything else again. It only seemed to angry the things here. I question our sanity. Did this really happened? Were our thoughts and state of minds being manipulated by the entities in our house. But for what purpose-scaring us, showing their strengths, showing that they're in control? I feel the purpose was to drive us deep into an abyss. One where there's no coming back from.